These very red Zamberalan Crosser goretex boots will be my two best friends over the coming months, my only constant companions and direct support as I walk from Canterbury to Rome along the Via Francigena trail. 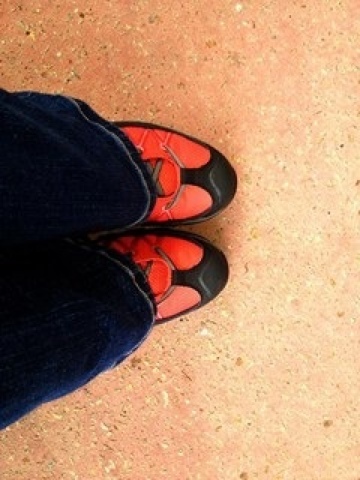 For my Tuscan walk, I purchased a pair of trail runners without much thought and without seeking advice or assistance. My only requirements were that they were mostly black, my preferred colour for sports shoes, and that they were inexpensive as I would only be wearing them for a week after which time they would probably be discarded as they would not be required for the rest of my travel plans. I found a pair of Asics trail runners that met both of these requirements. However, when deciding to buy them, I neglected the most important aspects; comfort and fit. I put them on my feet. Took a few steps around the store and decided they would do the job. I took them home and packed them in my bag without even breaking them. Not once did I wear them before I left to go to Italy to walk 120 kilometres. Not once. I realised the scale of my ignorance and poor decision making on the first day of that walk. Walking off road through hilly countryside is not the same as walking around the flat plains of the city. Your feet and knees are under all sorts of movement and strain not experienced on flat, concrete or bitumen covered ground. Walking off-road in shoes that are not broken in and are at least half a size too small is just agony. I killed my feet in the first ten kilometres of that walk. The nail bed on my right big toe was swollen and inflamed for the whole 120 kilometres. By the end of my walk, I couldn't even put my shoes on. My nail went black as the did the nail on my right little pinky toe. A few months later, they fell off but not before I snagged them on socks and clothing that ripped the healthy sections bit by bit, ever so painfully, from their nail bed. I learned a valuable lesson. This time, after making the decision to walk the trail, the first thing I did, even before booking my flights, was start looking for appropriate footwear because at that stage I knew I would have only ten weeks to break them in. I started reading forums trying to find out what type of footwear would be best for this walk and to try and learn something about hiking shoes because I knew nothing and I'm not sure how much I really know now except this....that everyone has their own opinion about hiking shoes and at the end of the day you just need to go and try on shoes and find the ones that feel right for you; and make sure your toes don't hit the ends when going downhill ie buy one or two sizes larger which will also allow for your foot to swell and spread, which it will because walking 2000 kilometres is not the kindest thing one can do to their feet. With the assistance of a very patient and understanding shop assistant (I highly recommend Richard and the whole crew @ Mountain Designs in Richmond), I tried on almost the whole range of hiking shoes several times, spending hours in the store. I finally decided upon a pair of Zamberlan Zenith hiking shoes which I chose based on fit and not for their grey colour but when I got them home and wore them around the house the placement of the seam on the tongue pressed against a sensitive part on top of my feet making them ache and go numb. I took them back and got a larger size thinking that might help. Same problem. So I went back again and tried on more shoes but this time I tried on boots deciding that some ankle support might actually help my ageing knees not ache painfully when I walk uphill and downl. I tried on several boots. However, my choice was limited. As a female with a US size 10 foot needing boots at least one and a half to two sizes bigger than my normal size so that my toes don't hit the end when I walk downhill, my choice was instantly limited. Keen Targhee were the most comfortable boot I tried on cradling my foot like a baby and leaving me sighing blissfully with each step I took but they didn't come in a large enough size for my big feet not to hit the ends going downhill. Salomon were the best looking coming in the pre-requisite black but were nowhere near my size. The mens versions were just too wide for my foot. I could feel my heels slipping with each step which meant only one possible outcome...blisters. And then there were all the others that were either too chunky or just too ugly in various shades and combinations of brown. I know brown shoes will hide the dust and mud and that hiking shoes are about function not fitness but if I'm going to live in the same shoes for three months I'd really just prefer something a little less ugly or at least plain black. Finally, I tried on the Red Beasts. They were the only ones I hadn't tried on and it was love at first fit. I bought them, took them home and wore them around the house. I tried to convince myself they were fine but something wasn't right. My right foot was perfectly happy but something kept pressing into and rubbing against my left ankle. I took them off and inspected them to discover a fault in the seam where the tongue joined the shoe. I took them back but they were the last pair in my size. And so I started the whole trying on process again. But nothing felt right. I really wanted the Red Beasts to be okay so much that I started contemplating if I could get a shoe repairer to fix them. In the end, Richard was able to track down another pair in Hobart and had them sent over for me as well as another pair from Perth to make sure that one of them would be okay. before I started breaking them in. I wasn't 100% convinced but after all the hours spent trying on and researching shoes I concluded that they were as good as I was going to be able to get. Sometimes we need to bide our time until the absolute right thing comes along. Other times, we have to make the most of what we've got knowing that perfect doesn't always exist. (although good merino socks and Injinji toe socks are partially to thank and highly recommended for that). start aching after 12 kilometres but I put that down to conditioning, just getting used to walking long distances rather than any fault of the boots. Over the last week, my feet are starting to ache and niggle even when I'm resting, leaving me to wonder if I really can make it all the way to Rome. I can't be sure but I won't know unless I try. Whilst the Red Beasts will help to get me there ultimately it will be the strength of my desire and tenacity that will carry me through. 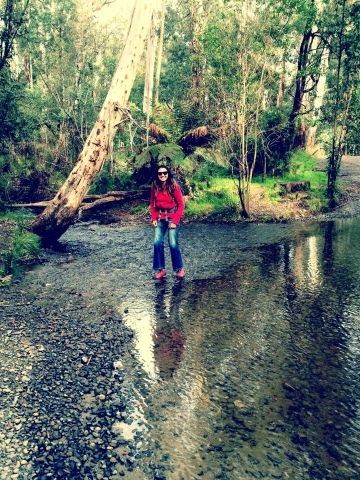 Fording the stream in my Zamberlan Crosser GTX boots near Healesville. "Via Francigena", "hiking boots", "hiking preparation", "pilgrimage"